ENHANCE GX-C1 Laptop Cooling Stand. 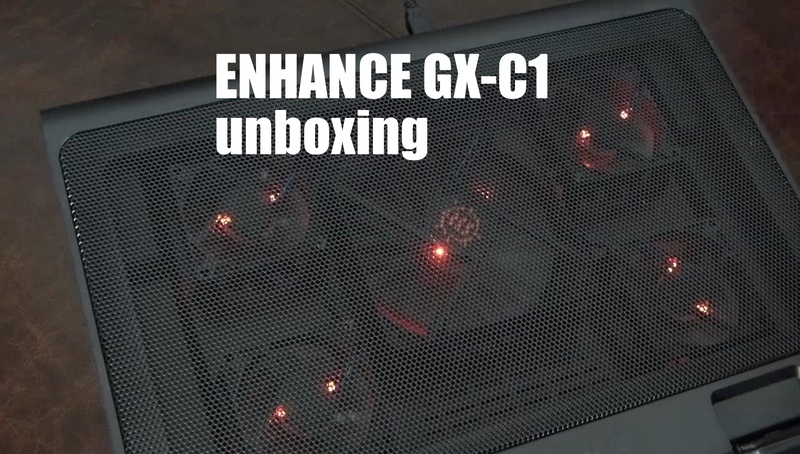 Premium Cooling LED Fans – Designed to minimize the overheating that can occur with laptop computers, the GX-C1 comes equipped with 5 ultra-quiet LED fans that produce an alluring blue light and provide superior airflow while maintaining a noise-free environment. The scroll wheel allows you to tune the power of the LED lights and fans. Turn them way up or keep them at a lower power to whatever fits your needs. Comfortable Ergonomic Design – The lightweight and versatile design lets you use the cooling stand in a stationary position or take it with you wherever you go. Its metal mesh surface helps increase airflow while pulling away excess heat from the bottom of your laptop. The 3 adjustable height settings provide you with multiple typing and viewing positions. Lay back on your bed and type on an incline or sit upright on your desk and type all while remaining comfortable. Built-in front bumpers help secure your laptop in place and prevent unwanted sliding. Dual USB Ports – The laptop cooling pad is powered by the USB port on your computer. It also comes equipped with an extra USB port so you can connect other devices for data transfer capabilities.